A few weeks back we sat down with singer-songwriter/novelist/composer/all around amazing artist Sara Bareilles to discuss her latest ventures in the world of theater, publishing, and the music industry. It's extremely impressive and you'll understand why we've taken to calling her 'The Empress of All Media' around these parts. Seriously, who writes a book, a Broadway play, and an album all within the same calendar year? Crazy people, that's who...NOT that we're saying Sara's crazy. Knock it off...we never said that! She's our absolute favorite and we felt privileged to be able to spend a little time with her. It's amazing that she had some time to spend with us, is all we're saying. We met up with Bareilles amongst the power lunchers in Midtown at The Four Season Restaurant, and somehow managed to squeeze in a few questions from her fans while chatting, which we've cut up into a little bonus video called, Dear Sara. 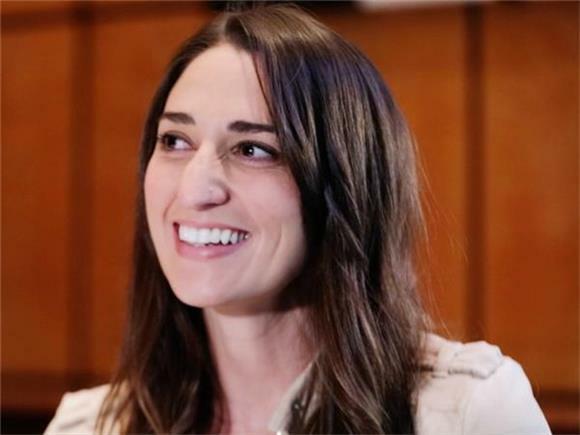 Ever wonder where you'll find Sara Bareilles hanging out in NYC? How she likes to spend her free time? The craziest thing a fan ever said to her? Who she follows on Instagram (It's not who you think...)? Or, on a more serious note, what she thinks of being a role model? We've got you covered.